Professor Buzuvis researches and writes about gender and discrimination in sport, including such topics as the interrelation of law and sports culture, intersecting sexual orientation and race discrimination in women's athletics, retaliation against coaches in collegiate women's sports, the role of interest surveys in Title IX compliance, participation policies for transgender and intersex athletes, and Title IX and competitive cheer. Additionally, she is a co-founder and contributor to the Title IX Blog, an interdisciplinary resource for news, legal developments, commentary, and scholarship about Title IX's application to athletics and education. 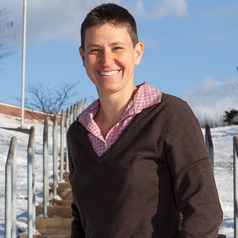 Professor Buzuvis currently serves as the Director of the Center for Gender & Sexuality Studies at Western New England University School of Law. She also teaches courses on administrative law, employment discrimination, Title IX, torts and property. Prior to joining the faculty in 2006, she clerked for Judge Thomas Ambro of the Third Circuit and practiced law at Goodwin Procter in Boston. She also spent time as a Visiting Professor at the University of Iowa College of Law.